Martin Luther King Jr. Day is a special holiday for many big reasons, but one smaller reason why I especially like this winter holiday is because it lends itself so well to activities in the language arts classroom. 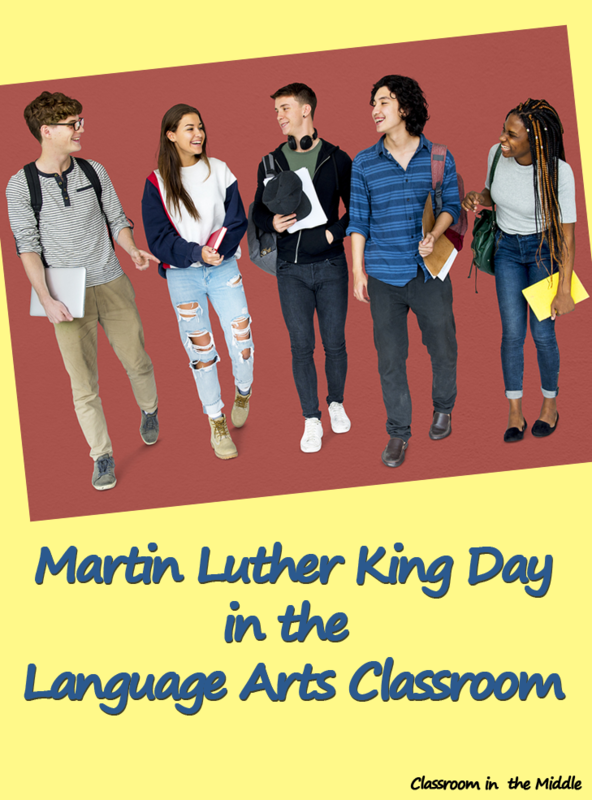 Whether you teach kindergarten or college, or something in between, there is a wealth of great content related to Dr. King Day and a wide assortment of ways to incorporate language arts lessons into your celebration of this day. Here are a few ideas. After learning about some of the ways in which Dr. King was a leader in bringing about all of the changes of the civil rights movement, students might be interested in thinking about the different ways people go about trying to effect change. An interesting opinion writing topic might be for students to write about what they think is the best way to go about effecting a change in society. For narrative writing, students often write about Dr. King’s life. To expand on this idea, students could write about another important African American whom they look up to as a hero. For example: the writer Maya Angelou, abolitionist Frederick Douglass, or aviator Bessie Coleman, just to name a few. Another idea is for students to begin with one word that is important to the day, define it, and then go on to talk about what is really means to them in detail. This assignment might be a combination of explanatory and opinion writing. 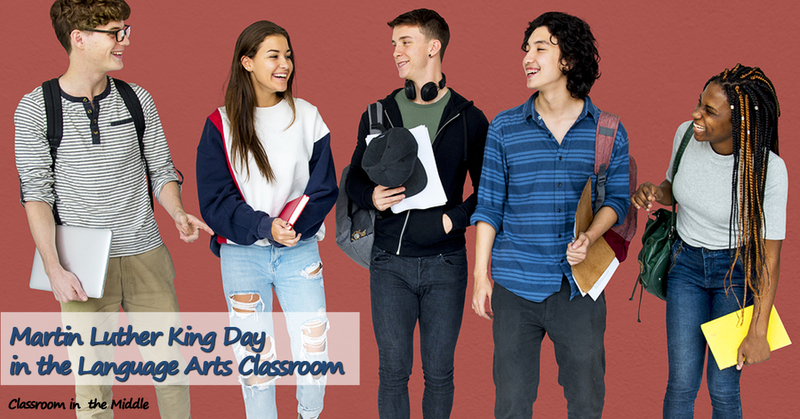 For this one, you’ll want “big” words that students have heard often in connection with this holiday’s significance. A few choices might be: diversity, character, civil rights, and tolerance. A tried and true speech topic for this day is for students to talk about a dream of their own. Or they could take any of the writing topics, such as the hero topic, and turn it into a speech. Since there is so much reading material available for Martin Luther King Day, this might be the perfect time for a reading lesson that compares two articles on the same topic. For example, you can find different takes on a biography of Dr. King from Biography.com, the King Center, and Ducksters. The first is a standard biography, the second focuses more on his achievements, and the third is written in simpler language for younger kids. Other biographical writings might focus on Dr. King’s place in history or one important event in his life. 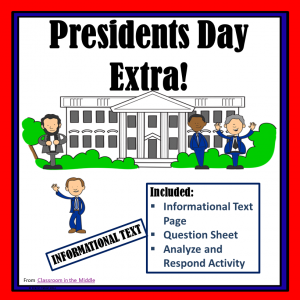 There is so much teaching content already out there for this holiday that I even found ready-to-use vocabulary lists that English teachers would find plenty of uses for. Here are two good ones. If you have a space for a holiday display in your classroom, here are a few possibilities for displays that the whole class would have a hand in creating. A collage of images from Dr. King’s life – Students collect images and then arrange them on a bulletin board, maybe with printed words mixed in to draw it all together, or with a poem written by a student poet of the day as a caption. A display of favorite diversity quotes – Each student chooses and illustrates one favorite quote. What I would like to be remembered for – After discussing Dr. King’s legacy, students write brief statements about what they would most like to be remembered for. 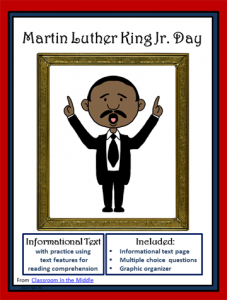 Here are some resources for Martin Luther King Day and other classroom holidays. 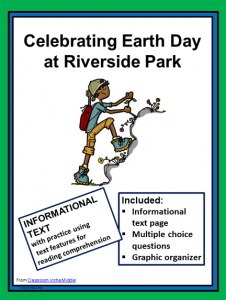 Each of these is an informational text activity with a magazine-style reading page, a page of multiple choice questions, and one additional activity sheet. Click on any of the images to see a preview.